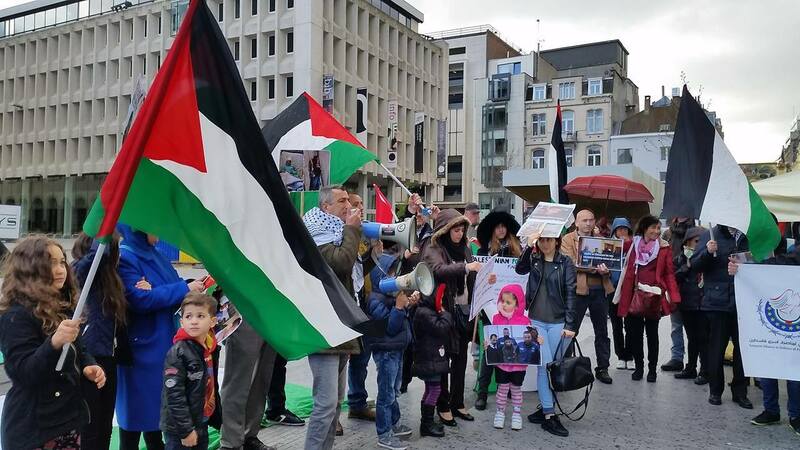 Palestinians and solidarity activists gathered at Place de la Monnaie in Brussels, Belgium on Sunday, 17 April to mark Palestinian Prisoners’ Day and urge freedom for the 7,000 Palestinian prisoners in Israeli jails and for the Palestinian people. Samidoun Palestinian Prisoner Solidarity Network participated in the protest alongside representatives of the Palestinian Community of Belgium and Luxembourg, the Association Belgo-Palestinienne, Palestina Solidariteit, the European Alliance in Defence of Palestinian Detainees, Plate-forme Charleroi-Palestine, Intal, the European Coordination of Committees and Associations for Palestine, and others, including members of the Tunisian community. of the Parti Socialiste (PS) expressing her concern for Palestinian prisoners, especially the over 700 in administrative detention without charge or trial. Grovonius, who has visited Palestine and met with current administrative detainee, Bisan Center executive director Eteraf Rimawi, has introduced a parliamentary resolution on administrative detention. 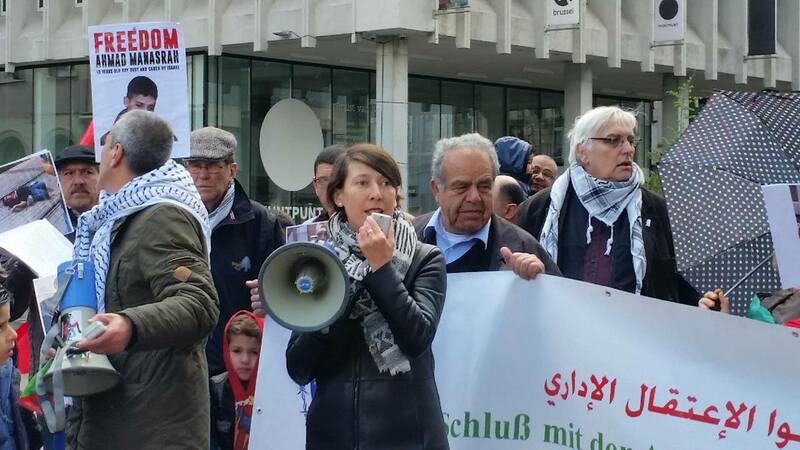 Claire Geraets, a deputy of the Workers Party of Belgium in the Brussels-Capital Region Parliament and a physician with Medicine for the People in Schaerbeek, spoke at the event, expressing solidarity with the Palestinian people and Palestinian prisoners. 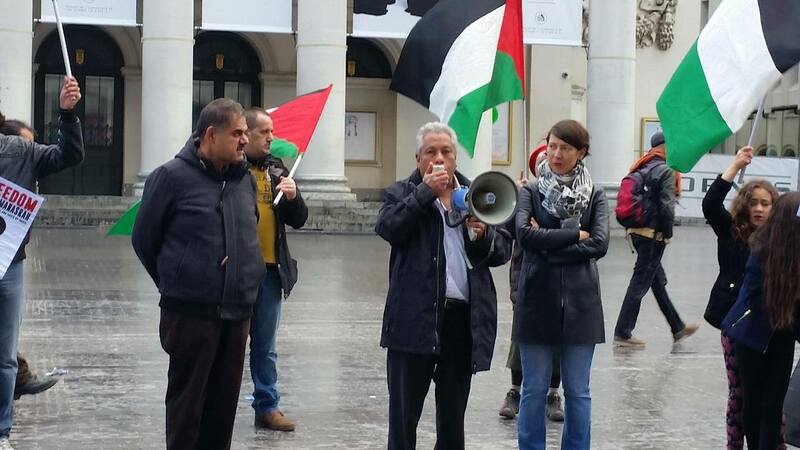 Hamdan al-Damiri of the Palestinian Community in Belgium and Luxembourg spoke about the current situation of Palestinian prisoners and their struggle for freedom. 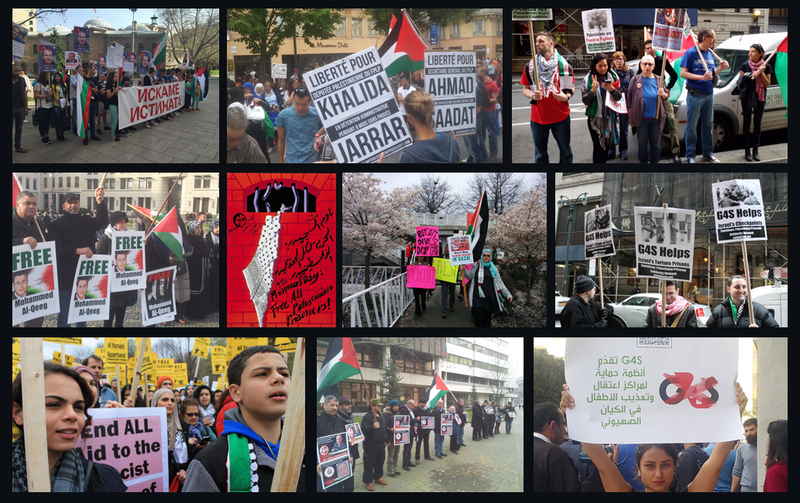 Charlotte Kates of Samidoun Palestinian Prisoner Solidarity Network spoke of the outpouring of international solidarity and the events across the world happening on 17 April, even as thousands of Palestinian prisoners were engaged in a one-day hunger strike. She urged the boycott of G4S for its continued complicity in Israeli prisons, checkpoints, detention centers and police training centers, and building the BDS movement to boycott Israel to free the Palestinian prisoners and the people and land of Palestine. Khaled Hamad of the European Alliance in Defence of Palestinian Detainees spoke about the Palestinian prisoners and their struggle inside the jails, highlighting the call to end administrative detention without charge or trial. 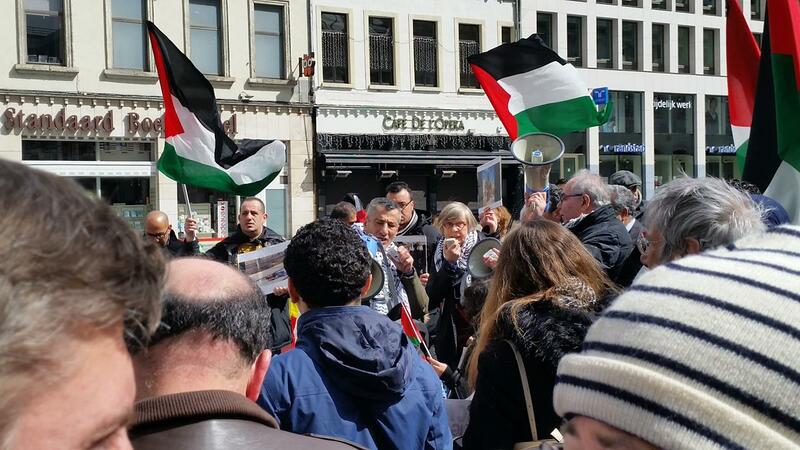 Hassan Balawi, of the Palestinian Embassy in Belgium, urged international support to free Palestinian prisoners. 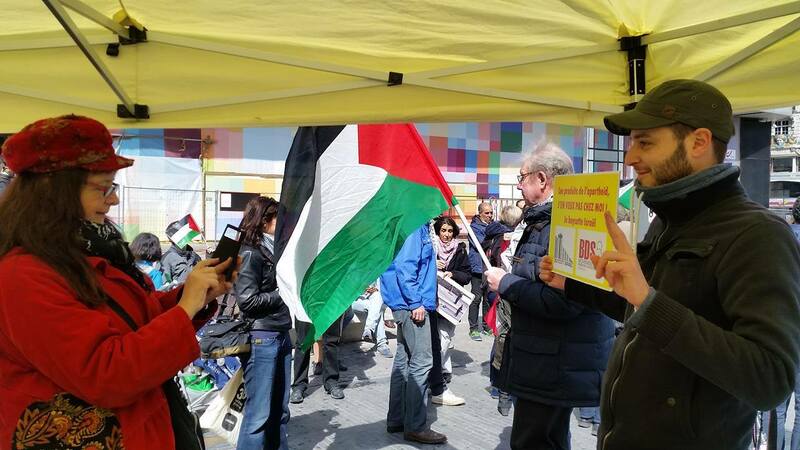 The event also highlighted the launch of a new photo exhibition and project developed by Palestina Solidariteit. Titled “If I were a Palestinian,” hundreds of photos of Belgian and European parliamentarians, politicians, scholars, writers, artists, lawyers, journalists, and more highlight the imprisonment by Israel of a vast array of Palestinians. Each Belgian or European figure was photographed “behind bars,” emphasizing their likely fate if they were Palestinians living under occupation. The exhibition will be touring in multiple places in the future. 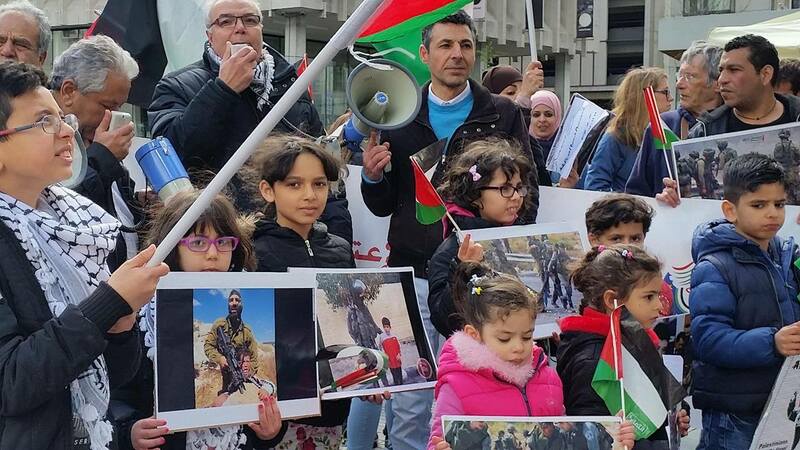 Palestina Solidariteit also launched a new video for Palestinian Prisoners Day, “700,” looking at the experiences and trauma of the over 700 Palestinian children arrested each year by Israel. Plate-forme Charleroi-Palestine collected dozens of photos at the event for their campaign, “I boycott Israel.” In response to the repression of BDS activists in France and calls to prosecute organizers for the boycott of Israel in Belgium, activists are collecting 1,000 photos of individuals across Belgium from all walks of life proclaiming their support for the boycott of Israel and the BDS movement to struggle for Palestinian rights.